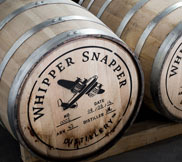 Whipper Snapper Distillery is getting ready to release its first product, a bourbon style whiskey. Based in East Perth, the distillery is set to open its doors next month offering locals their take on the classic American spirit which has been five years in the making, The West reports. According to distiller Jimmy McKeown, the spirit is created in the traditional American style with the use of handmade oak casks, however the spirit cannot technically be called bourbon as it is made outside of the USA. McKeown says that the name itself is not something that bothers him as he wanted to create a spirit that featured a local flavour. “Our corn comes from Kununurra and the rest of our grain from around WA,” he said. Managing director of the distillery, Alasdair Malloch said that a retired World War II bomber pilot was the inspiration behind the drink. “He brewed homemade beer and some moonshine, so he was a great example to follow as a young man,” said Malloch.